I actually get asked this all the time in my practice. Many people seem to be under the impression that mushrooms are nightshade or that they grow their own toxic fungus! Let’s take a hot second to wade through the few precautions around eating mushrooms and clarify whether they are good or bad for you! SHOULD I AVOID EATING MUSHROOMS!? While it is true that there are many toxic mushrooms out there, the kind that we have cultivated into our culinary world are in no way toxic, nor do they grow toxic fungus on them! The only precaution I would take with mushrooms might be with clients who have mould overgrowth. Mushrooms are slightly more likely than other vegetables to accumulate mould, simply because of their physical structure and their ability to trap moisture. Wash well friends! While it is true that mushrooms can grow in the shade, they are not classified as a nightshade vegetable. Nightshade vegetables are categorized based on their glycoalkaloid content, the inflammatory component in tomatoes, potatoes, peppers and eggplants that may damage the gut lining and act as an adjuvant in the bloodstream, provoking excess inflammation tied especially to arthritic pain. Mushrooms do not contain these components. I do, however, precaution that it is best to eat all mushrooms cooked. Mushrooms have very tough cell walls that are close to indigestible if you don’t cook them. Cooking them will also kill off the bacteria and mould that they may accumulate. Heating mushrooms also releases the nutrients they contain, which brings me to why we SHOULD eat them! Short answer is HECK YES! Let’s get into some of the big benefits, shall we? Mushrooms are one of the FEW vegetables that contains reasonable amounts of Vitamin D. This essential vitamin can increase the absorption and metabolism of the other vitamins and minerals in mushrooms, particularly calcium and phosphorus. Mushrooms contain a unique and powerful antioxidant called Ergothioneine. It is extremely effective at providing protection from free radicals and boosting the immune system. Technically, it is amino acid that contains sulfur, which is an essential compound for detoxification that many people are deficient in. It is the beta-glucans and conjugated linoleum acid (CLA) found in mushrooms that boast the anti-carcinogenic effects. Mushrooms have proven very effective in preventing breast and prostate cancer because of these unique compounds. Linoleic acid is particularly helpful in suppressing the harmful effects of excess estrogen, which is what commonly leads to breast cancer. The beta-glucans are particularly powerful at inhibiting the growth of cancerous cells in the case of prostate cancer. Many other studies have confirmed the anti-tumor properties of mushrooms. Mushrooms contain plenty of fibre and certain enzymes that may help to lower cholesterol levels. They are also a lean source of protein, which helps burn cholesterol when they are digested. These effects are likely to balance LDL (bad cholesterol) and HDL (good cholesterol) and prevent cardiovascular diseases such as atherosclerosis, heart attach and stoke. When you are so deficient in iron that you experience fatigue, headaches, reduced neural function and digestive issues, you may be considered anemic. Mushrooms are a fantastic source of bioavailable iron, which promotes the formation of red blood cells and keeps you functioning at your full potential! Mushrooms are a great addition to a diabetics diet because they provide plenty of protein, vitamins and minerals without much in the way of carbohydrates. They also contain plenty of water & fibre, which will slow the absorption of any sugar into the bloodstream. On top of that, they contain certain compounds which help boost the function of the liver, pancreas and other endocrine glands, thereby promoting the formation of insulin and its proper regulation throughout the body. Mushrooms are a great plant-based source of calcium, an essential nutrient in the formation of healthy & strong bones. Getting enough calcium in your diet can reduce your chances of developing conditions such as osteoporosis, and can also reduce joint pain and lack of mobility associated with bone degradation. 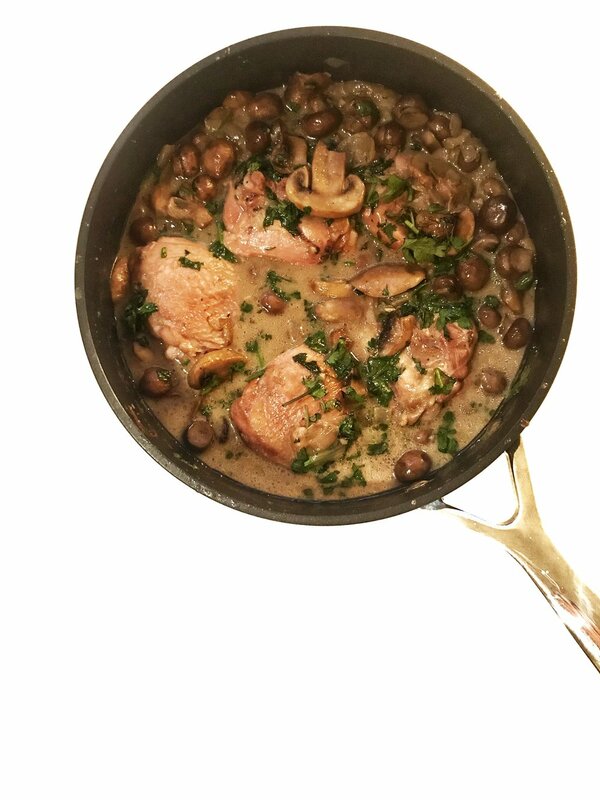 So now that you’re ready to get more mushrooms in your life… I’ve got just the dish for you! Eat up! 2) Place the chicken thighs in the skillet, skin side down, and brown them well. 3) Remove the browned chicken pieces and set them aside, retaining the fat in the pan. 4) Turn down the heat and add the shallots & mushrooms. Cook until softened. Then, turn the heat back to medium and continue cooking until they are lightly coloured. This technique adds flavour. 5) Add the garlic and cook for another two minutes. 6) Pour bone broth over the pan, stir and return the chicken to the pan as well. Cover and simmer for 10 minutes. 7) Remove the cover, stir in coconut milk and bring back to a simmer. Keep the lid off and let cook for another 10 minutes or until the chicken is cooked through and the sauce has thickened. 8) Give the sauce a taste test and add salt if needed. Toss in the herbs and serve!